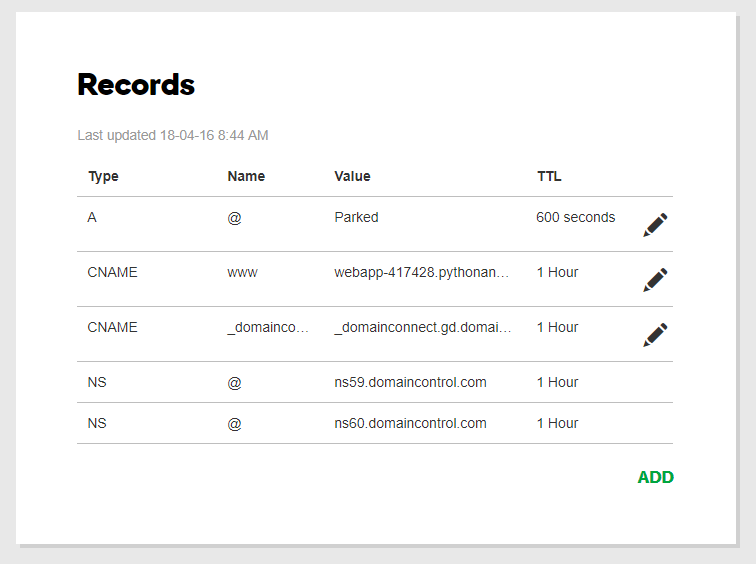 I have registered a domain and provided the CNAME, however, it isn't still working. I'm I doing anything incorrectly? Can I have multiple CNAMEs? 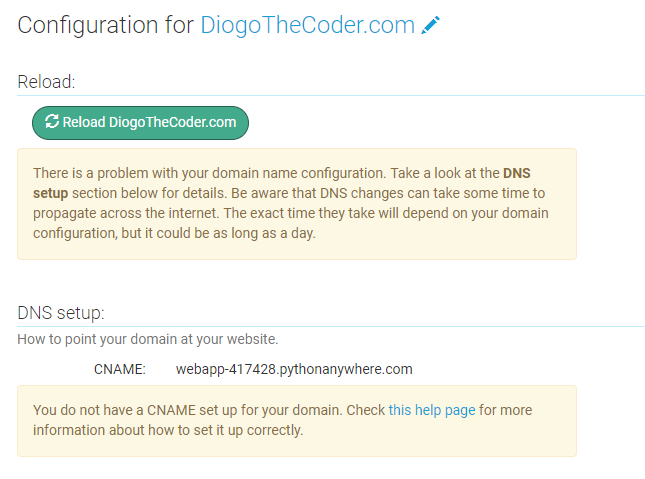 www.diogothecoder.com is an alias for webapp-417428.pythonanywhere.com. 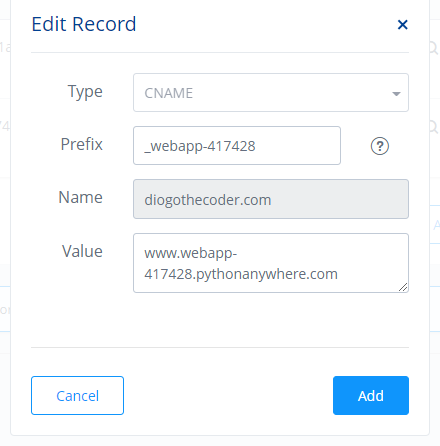 _webapp-417428.diogothecoder.com is an alias for www.webapp-417428.pythonanywhere.com. Also you'll need to edit (pencil icon) at PA your webapp's name to include the 'www.' prefix! 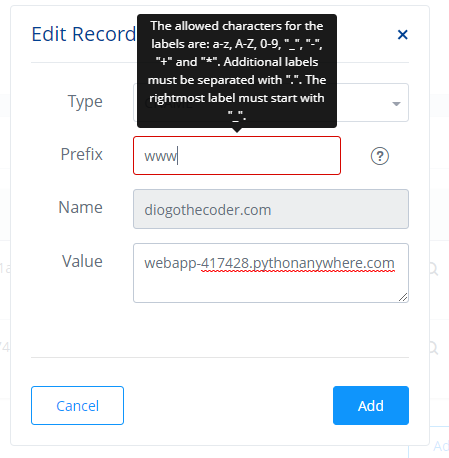 When I try to change the prefix to be www, I get an error, is it alright if I add an underscore to the beginning of the prefix as the websites wants to? I have decided to end my hosting with 1&1 and have switched to GoDaddy. I am waiting for 1&1 to transfer my domain to my new provider. In the meantime, I have also bought the domain name DiogoTheCoder.co.uk. Below is the current setup wondering if this is correct? 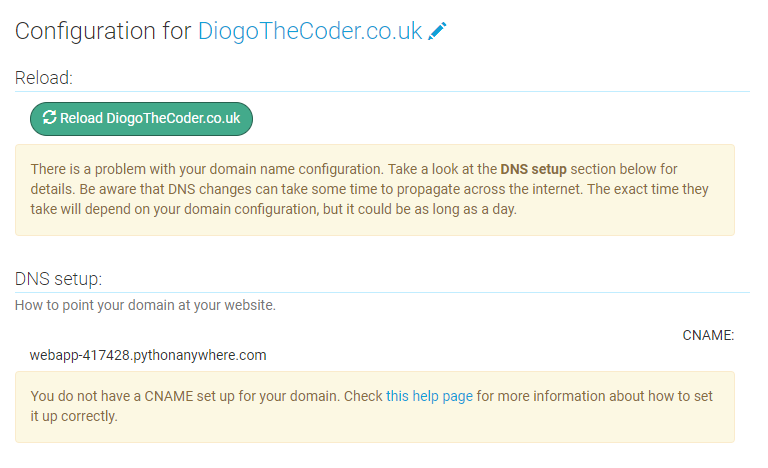 Changed the webapp domain to www.DiogoTheCoder.co.uk and the website is now working, how do I implement the ability for users to be able to redirect to my website when they type just DiogoTheCoder.co.uk, no www. You can set that up with GoDaddy -- this is the appropriate help page on their site -- you need to use the "forward to any site" option.